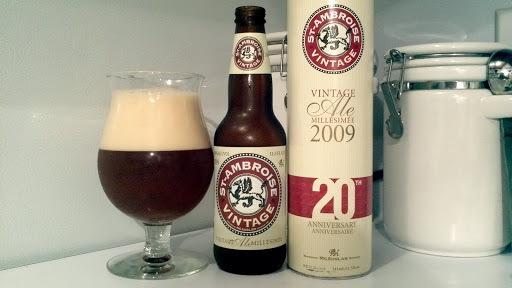 Review of St-Ambroise 20th Anniversary Vintage Ale Millesimee 2009 | Beer Apprentice - Craft Beer News, Reviews, Interviews and Info. Today I have another Barleywine to review. This one comes to us from the McAuslan Brewery located in Montreal, Quebec, Canada and it’s called the St-Ambroise 20th Anniversary Vintage Ale Millesimee 2009. It’s always exciting to experience a beer from a brewery I’ve never tried before, so here’s to good findings. First, the description from the website, mcauslan.com. Made with a blend of wheat and barley malts, including Munich malt, this unfiltered ale has a lovely deep-orange colour, rich maltiness, hints of caramelized fruit that recall plum pudding, and a surprisingly crisp, balanced finish provided by classic Goldings hops. Serve St-Ambroise Vintage between 13 degrees and 15 degrees Celsius, preferably in a port glass or brandy snifter. Also, this vintage ale will improve with age for a number of years. Store in a cool, dark place…. Well, my snifter wasn’t clean, so I’m using my tulip glass. The appearance was a dark amber to burgundy color with an off white head. It poured to an enormous size with a relatively easy pour right down the middle. It was soapy, smooth and soft. Very nice retention time and the lacing was slightly above average. It became more clear as it warmed. Not bad to start. The aroma revealed a very nice caramel fragrance. Like those caramel “square” candies. It also relinquished hints of sugar, toffee, dark fruits of raisins and plums along with minor hints of vanilla. Like many others of this style, I started to detect background notes molasses, biscuits and an ever present alcohol tone. The overall aroma is strong and robust, however it’s not nearly as prevalent as some other Barleywines I’ve had in the past. It does seem to be balanced well though. In the taste I found decent dark fruit flavors of raisins, plums and figs. A very small amount of bitterness tickled the sides of the tongue. A definitive boozy overtone was not to be denied. More of the sweet caramel and toffee sugars with a vanilla bean subtlety. It sort of reminded me of a very thin maple syrup. A relish of toasted biscuits and bread finished off the profile. Like the aroma, it seemed to be balanced fairly well. The mouthfeel was medium, dry and smooth. It wasn’t as sticky or thick as some other Barleywines I didn’t think. It left plenty of flavor behind though. A good burn on the initial swallow, which fades to a welcomed warmth. It’s not too intense, but it’s worthy. The carbonation may be lacking just a little, however it still has an above average mouthfeel. Overall, I thought this was a good, solid Barleywine. It represents the style very well. Again, not the best Barleywine on the market, but still a worthy and worthwhile drink. Like most, I could enjoy this as a late evening sipper with no problem. Seems like a brew for the Fall season, of which is fast approaching. If you see a bottle and favor the style, pick it up, give it a go and let me know what you thought of it. Do you guys favor Barleywines? Thanks to everyone out there. I appreciate the support.